Augmented Reality (AR) in architecture enables you to have a display, in a Smartphone or a Tablet, of a computer-generated 3D model of your architectural design set in the real physical space/environment where you want to place the design at the time. AR techniques employ advanced technology such as computer vision and object recognition and the information about the surrounding real world of the user/viewer to make it possible for them to interact with and digitally manipulate the AR production. ARDIFICE™ is an app that is custom-made for AR Production of an architectural design with the use of computer generated 3D Models ready to be set in any real physical space where the user/viewer is at the time. It also has the facility to transition the display from an AR Production to a Virtual Reality (VR) Production. 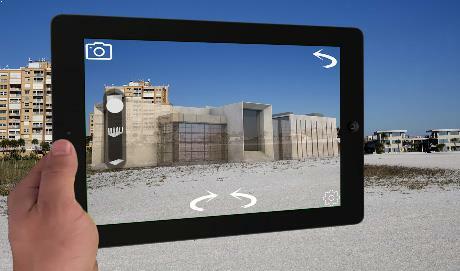 A good application example where such techniques are used is described as follows: A customs-built ARDIFICE™ app, when triggered to do AR Production, presents a model of a house that may be sited digitally on/at an empty plot of land surrounded by existing buildings; in the correct proportion in terms of relative dimensions, the app then prompts the viewer/user to tap on various parts of the house model to have an enlarged view of the parts of the house and further prompt the viewer to tap to select to view what/how the various parts of the house would look when properly/stylishly furnished and decorated in VR Production that allows the viewer to “tour” or look around in the interior of the display by going to the left or to the right or going deep into the scene of the decorated space.